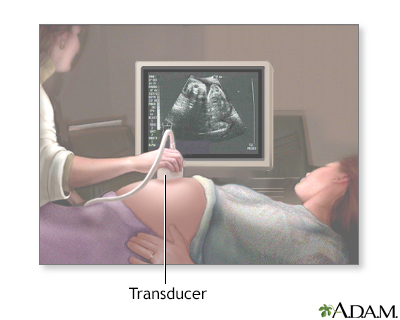 The ultrasound has become a standard procedure used during pregnancy. It can demonstrate fetal growth and can detect increasing numbers of conditions in the fetus including meningomyelocele, congenital heart disease, kidney abnormalities, hydrocephalus, anencephaly, club feet, and other deformities. Ultrasound does not produce ionizing radiation and is considered a very safe procedure for both the mother and the fetus.